This item will be released on July 30, 2019. The Big Idea Gang is buzzing with excitement! 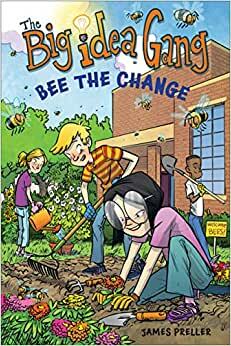 They're going to show Clay Elementary just how important bees can be in this chapter book series about making a case - and making a difference - by the author of Jigsaw Jones. AGES: 6 to 9 AUTHOR: James Preller is the author of the popular Jigsaw Jones mystery books, which have sold more than 10 million copies. He is also the author of Bystander, named a 2009 Junior Library Guild Selection, Six Innings, an ALA Notable Book, and the Scary Tales series of mystery-horror stories for children. Pre-order Bee the Change (The Big Idea Gang) for your Kindle today. James Preller is the author of the popular Jigsaw Jones mystery books, which have sold more than 10 million copies. He is also the author of Bystander, named a 2009 Junior Library Guild Selection, Six Innings, an ALA Notable Book, and the Scary Tales series of mystery-horror stories for children. James lives in Delmar, New York with his wife, three children, cats, and dog. Visit him at www.jamespreller.com.